Don’t mess with the dead. 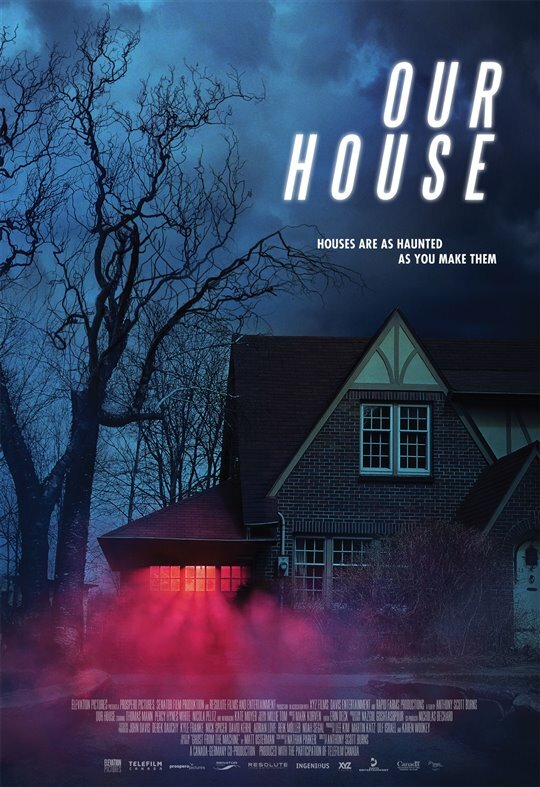 That’s the main lesson to be learned from Our House, a small but entertaining new ghost story from director Anthony Scott Burns that is itself a remake of Matt Osterman’s 2010 indie film Ghost From the Machine. The film follows Ethan (Thomas Mann) who, along with his girlfriend Hannah (Nicola Peltz), is working on a machine at university that will be able to provide wireless electricity. But when his parents are suddenly killed in a car accident, Ethan is left to care for his younger siblings Matt (Percy Hynes White) and Becca (Kate Moyer). Cut to three months later, and Ethan has brought the machine home to his garage, working on it in his spare time. The machine doesn’t work for what it’s intended to do, but the electromagnetic fields that it sends out have unexpected consequences. When he turns it on, strange things start happening around the house, leading the three siblings to believe that they are being contacted by their parents from beyond the grave. Ethan becomes determined to use the device to contact them, but what if the machine has also unleashed something much darker? So there is no disappointment amongst more seasoned horror fans who go to see the film, it’s worth noting that Our House is not particularly scary, and is fairly tame even by its PG-13 (14A in Ontario) standards. But it’s also a frequently enjoyable little film, that maintains an intriguing and at times spooky tone throughout, and is carried by likeable performances from its young leads. Shot in Toronto, the production values are solid across the board, and the whole film has a polished feel to it that makes it easily digestible for audiences. It’s also short at barely 90 minutes, making it just the right length to tell a satisfying story that doesn’t overstay its welcome. Overall, Our House is a fairly enjoyable ghost story that gets the job done well enough to make it worth a look. Our House is now playing in limited release at Cineplex Cinemas Yonge-Dundas in Toronto, and is also available to watch on demand.